I’ve had a ton of people asking me what I’ve been doing since KC. The week after KC I spent in Shetland with the J&S group. I will blog about it, but I have a lot to write (and until recently, hadn’t felt like writing all that much!) However, what I have spent a lot of time doing is spinning. 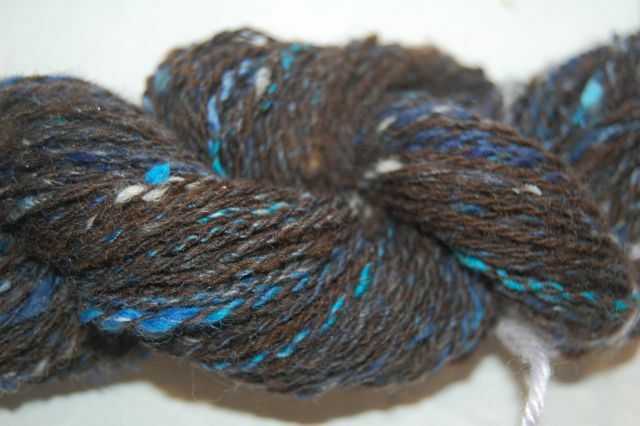 For whatever reason, I get back from KC and Shetland and instead of the spirit moving me to knit, it moved me to spin. 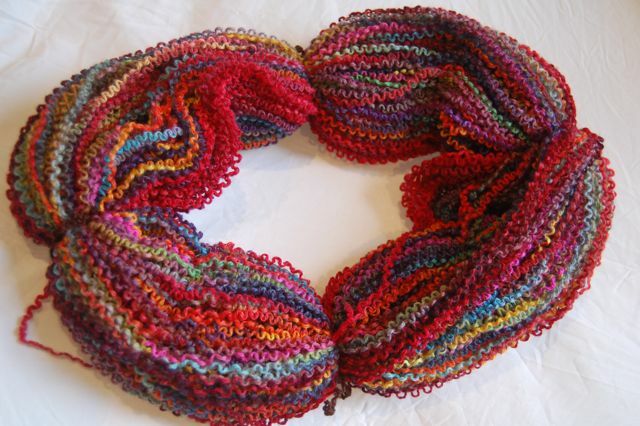 First off, I plied a bunch of the samples that I had made at KC and Knit Nation (which I will also write about!) I just Navajo plied them since they were already a mix of stuff and I plan on using the resulting odd yarn in one of my scrapghans. 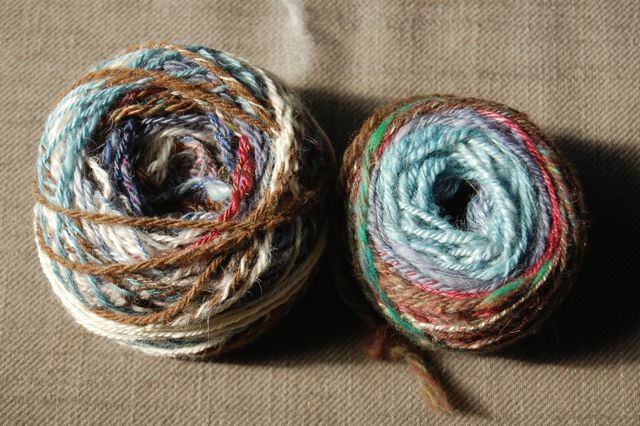 I always make sure that there is at least a little bit of handspun in each one that I make. Then I plied two bobbins of singles that I had spun (ah-hum) last winter from a fleece that I had gotten at Rhinebeck in 2008. Now, here’s the ironic part of all of this. I took two classes on how to spin laceweight this summer. One at KN and one on Shetland. 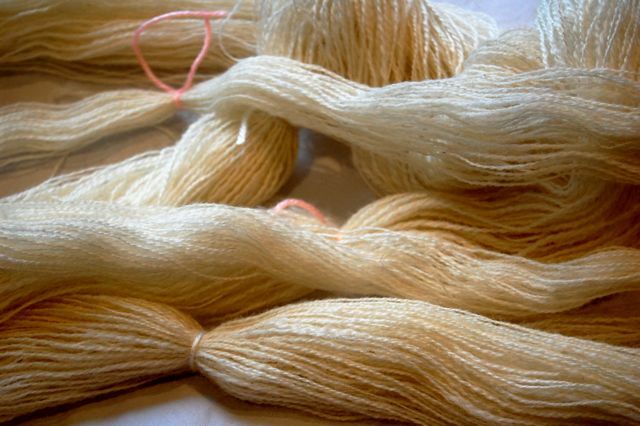 When I plied these 2 singles that I had spun last year they came out about as fine at the J&S laceweight. Doh! However, I can now spin even finer, so will definitely be spinning more for lace! I also had a batt and a half from Fyberspates. The half was left over from my class at KN and the whole one I purchased over a year ago at the Ravelry Day in Coventry. I spun these both up and Navajo plied them as well. 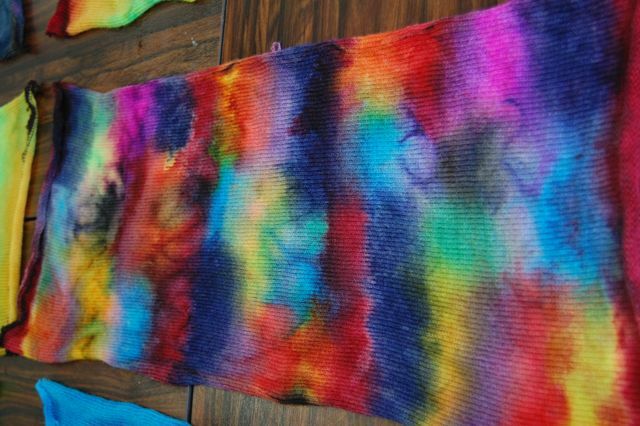 Then I got into a super sparkle batt that I had gotten at Woolfest in 2009. I learned a couple of important lessons with this one. First off, a good scale is really valuable when spinning. 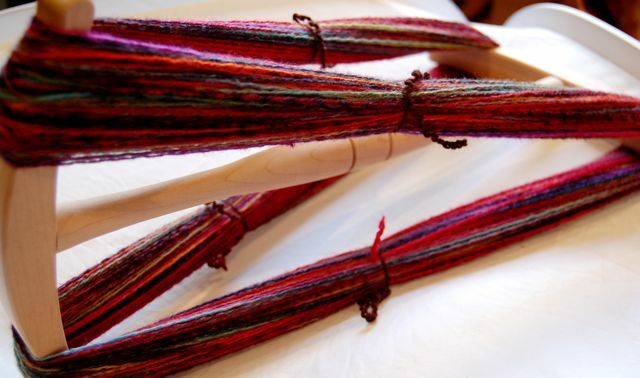 Second, do make a test strand when you are plying. I had decided that this was going to be a 2 ply, so I had weighed the batt and divided it into 2 equal parts which I then spun-up. So far, so good. I then plied the singles making a nice enough yarn, but not what I had been aiming for precisely. I should have just stopped there, and tried something else, but I was fully invested in the path that I had started down. So I kept pressing on, plying and plying until I got to the end of one of the bobbins. There was still a few meters on the other one, so I decided to just Navajo ply it to be done with it. Imagine my dismay when I realized that the Navajo plying was giving me exactly what I wanted! Doh! I think that this is definitely one of those “live and learn” moments! I also did something that I’m pretty sure is naughty. I was trying to knit a shawl with the sushi roll that I dyed at KC in Jon‘s class and I was getting really annoyed with the little bumps caused by the unraveling of already knitted yarn. So, I yanked the whole thing out and skeined it and then washed it and weighted it to pull out the ridges. I don’t think that doing that in itself is all that bad, but the fact that I didn’t knit it straight from the roll makes me feel a bit guilty. 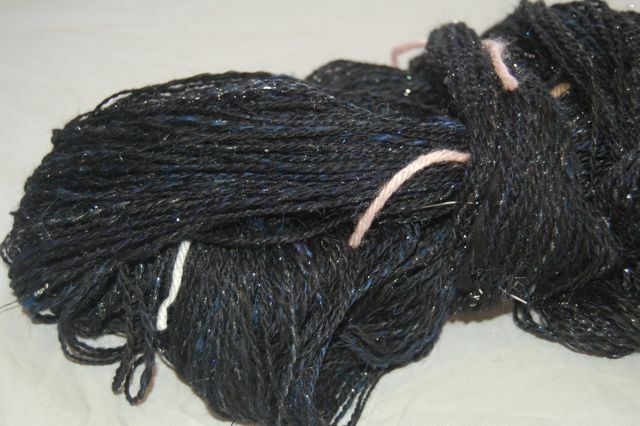 However, it made some really pretty yarn I think! ...and in all it's bouncy glory. *I edited this post to change the title a bit as I realized belatedly that I had already used that one. Opps! You’ve been enjoying yourself, unwinding from the stress and just having a good time! We meant to ask while over there, “Why are you in the UK?” Job? Military? Just because? Boring reason, the hubby got transfered for his job. Not so boring really, he has a job. 🙂 How close are you to London? I think we might be back over in about 1 1/2 years. We are planning a trip for when Kim turns 18. I know, it was so funny that you were e-mailing Barbro and I to tell us that you have a free night! Do you remember what Stephanie`s friend said about the Outlander books???? ?